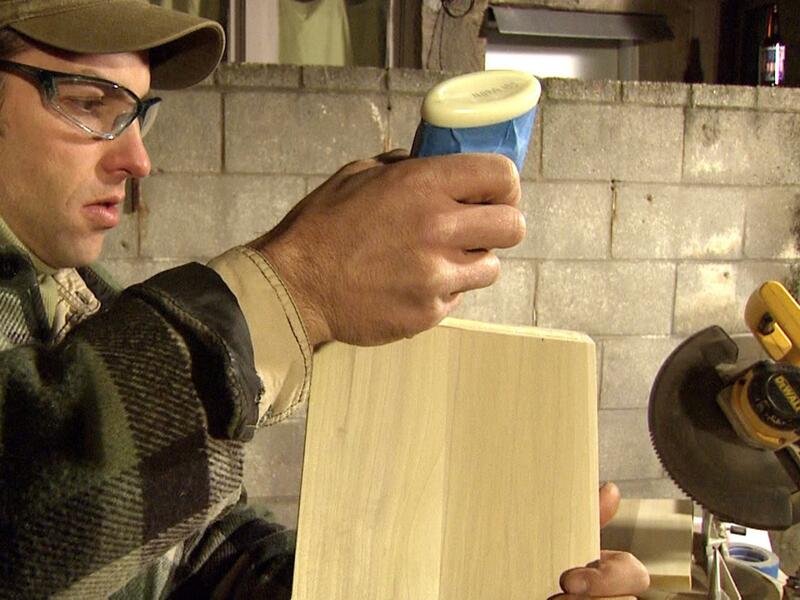 With the help of Marc Bartolomeo, making a wooden wine rack is a snap. 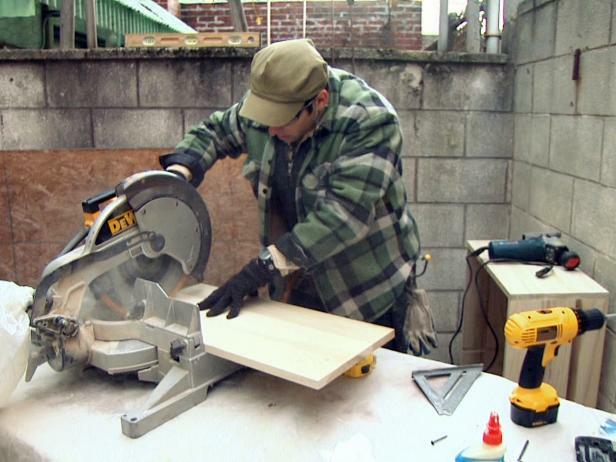 Host uses a saw to cut wood to make a wine rack. After determining the size of your unit, cut the top, bottom and sides of the box from 1x12 x 6’ maple planking using your power saw. Also, cut a 2” strip the length of the wine rack, which will later be used to hang the wine rack on the wall. Close up of a tool cutting into wood wine rack frame to make rabbit joints. 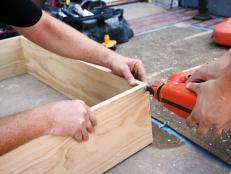 Set aside the two side panels and locate the interior sides of the top and bottom pieces. Find the center lines of both the interior upper and interior lower panels and mark a 3/4” wide strip on each. 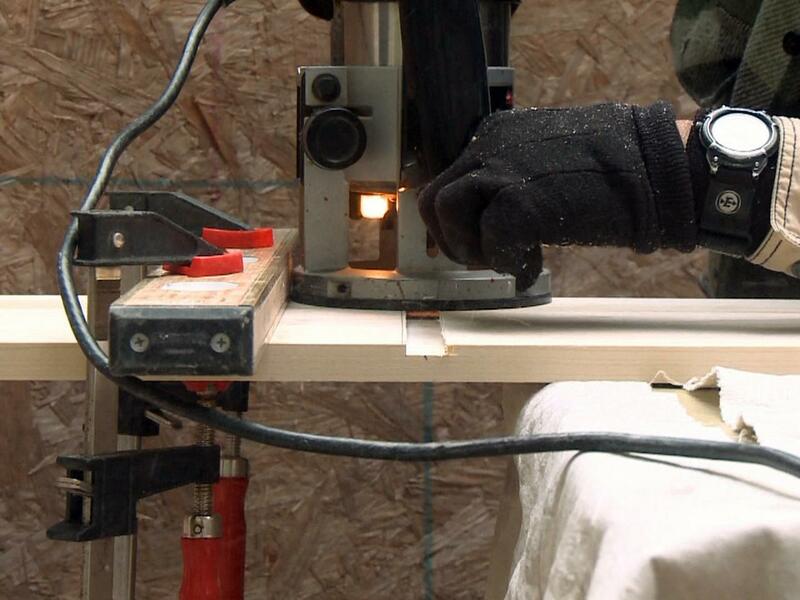 Using a router or circular saw, notch out both laterals at a depth of 3/16" the entire width of the boards from front to back. This will create a “rabbet joint” – essentially, a U-shaped groove in the wood that will accept another piece of wood, cradling it, by locking it in on both flanks. You are now ready to glue, nail and screw the four sides of the wine rack together. 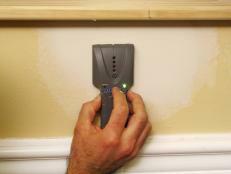 Try to use screws in areas that will not be visible. Construction of a wooden wine rack - host uses a drill to assemble the frame. 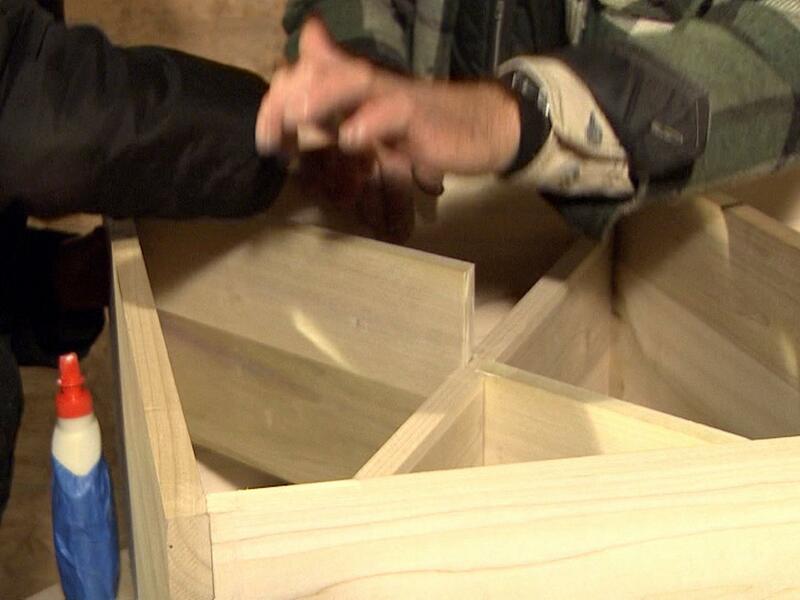 Assemble the sides to create the wine rack’s box-shaped frame. Glue, nail and screw the perimeter together. 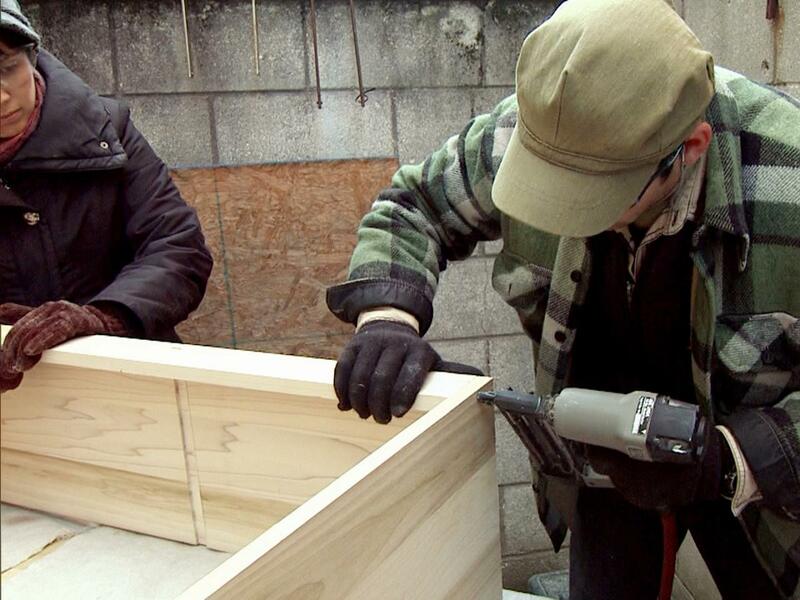 Next, lay the box down on its face and install the 2” strip along the top/back edge of the unit, keeping it flush with the rear surface. This strip will not only be used as the hanger for the rack to the wall and into the beams to carry the weight of the wine bottles, but it will also keep the unit perfectly square. Turn the unit over on its back and reveal the face, plus the two rabbeted joints. 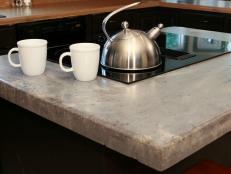 Measure the height of (distance between) the grooves at their deepest part. If you are using 1x material, that measurement should be the height of the unit minus 3/8" for the two 3/16” rabbeted grooves. Host uses a hammer to add a divider to the wine rack frame being constructed out of wood. 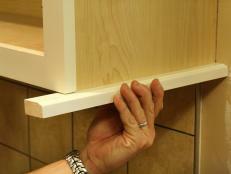 Cut a piece of wood the height of your measurement and the depth of your wine rack to be used as a divider for the unit. 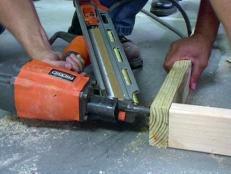 Cut a 3/4” x 2” notch out of the top/back portion of the divider to fit around the hanger strip. Glue, nail and/or screw it in place between the top and bottom portions. This rabbeted divider will add stability and keep the wine rack aligned. 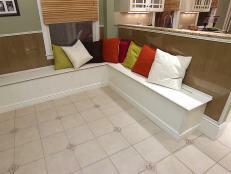 You should be left with two equally spaced compartments. 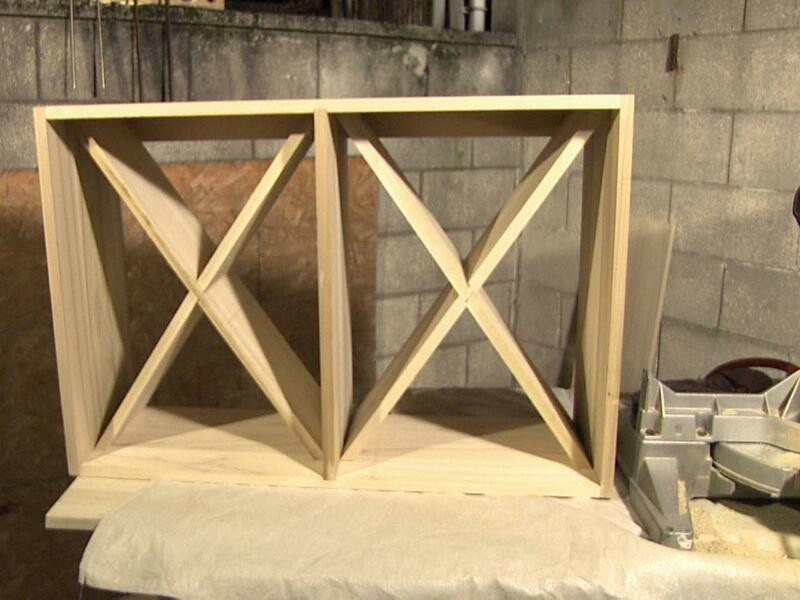 You are now ready to fabricate two X-shaped supports to create eight triangular shelves for wine storage. 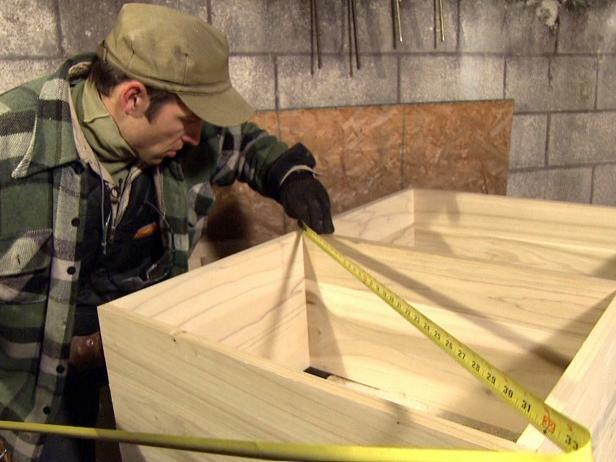 Host measures the wooden wine rack frame before adding the diagonals. Close up of an angled shelf on a wine rack that is being constructed. 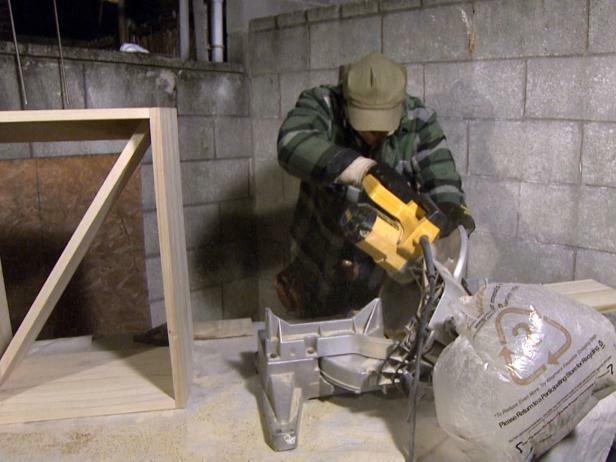 Host uses a saw to cut the wood piece at an angle to make the shelves of the wine rack. 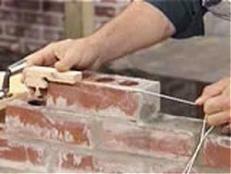 Measuring within one of the two individual compartments on a diagonal from an upper to a lower corner, determine the distance (Image 1), and cut a piece of wood using two 45-degree angles in the shape of a parallelogram (Image 2). 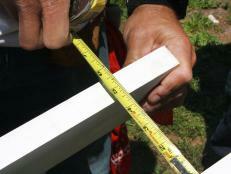 Measure and cut the remaining angled piece for the second compartment (Image 3). 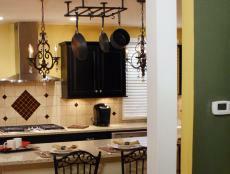 Slip the two angled shelves into the unit in either an “A” or a “V” shaped letter. This cut should be snug. 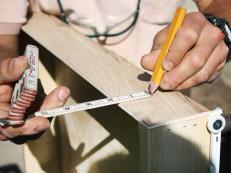 So, measure three times and cut once! The smaller support shelves will create four triangles in both compartments of the unit. 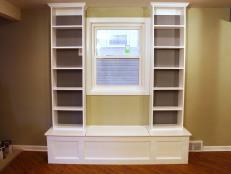 Do not affix the longer diagonal shelves yet. You will need to rabbit these first at the cross section of the intersecting smaller support panels. Once again, measure across the longer shelves on the diagonal from corner to corner and cut a second set of parallelogram shaped inserts, which will be ripped in half. 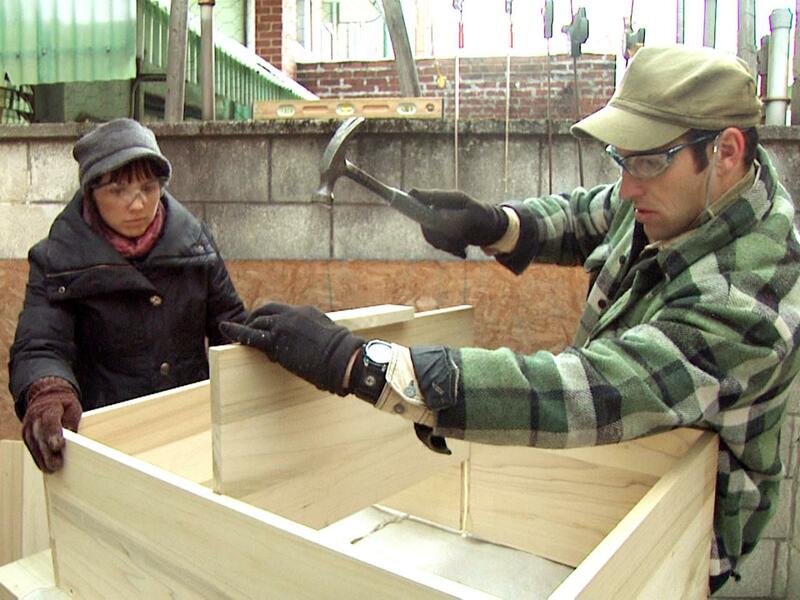 host uses a tool to cut rabbit joints into the wine rack frame for this furniture construction. After cutting the second set of diagonal supports directly in half, hold them in place for the marking of the remaining two rabbeted joints to be made in the first set of longer diagonals. 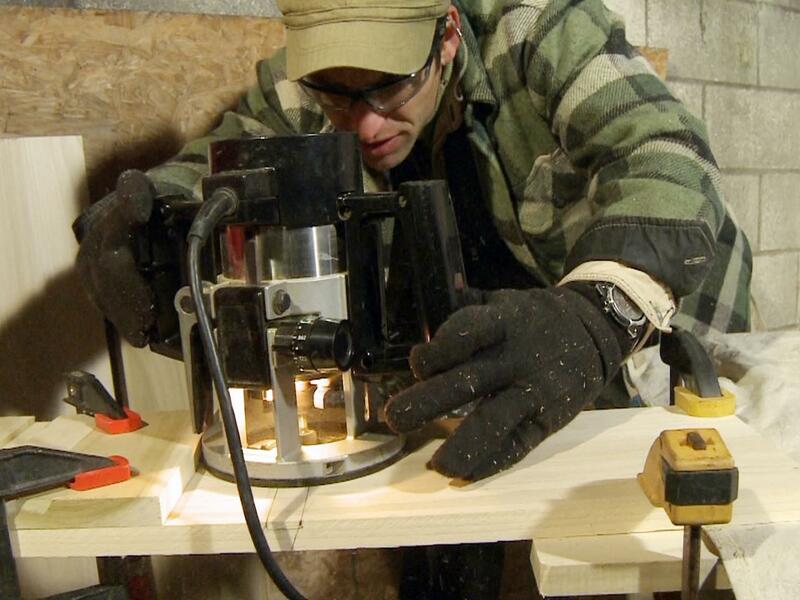 Using a router or circular saw, rabbit out two 1.8” grooves at the centers of the longer support shelves. These rabbet joint grooves should be directly opposite one another on the upper and lower compartments. Leave a thin ribbed section in the middle of the boards, which should measure between 7/16” and 1/2” wide if you are using 1x plank material. 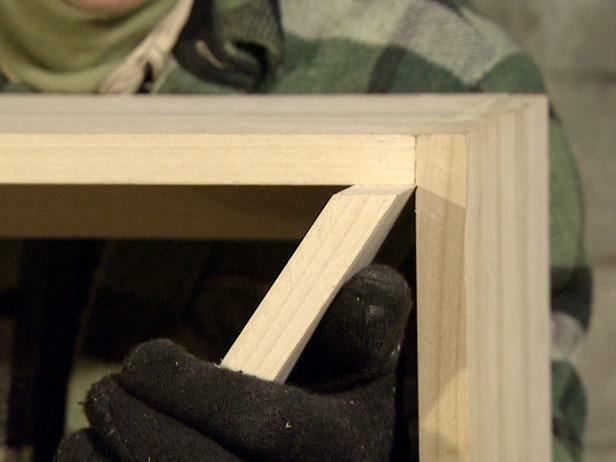 Host uses wood glue to install diagonals into the wine rack frame. Wine rack construction - installing small pieces int othe wood frame. Finished wine rack before it was painted with diagonal shelves. You may have to trim the four smaller supports slightly to fit into the corner of the wine rack and into the rabbet groove. 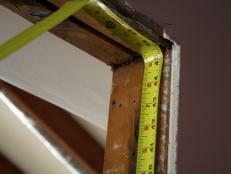 First install the longer diagonals with the mirroring grooves with glue and nails (Image 1). 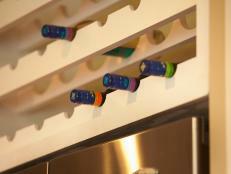 Repeat by adding the four smaller pieces into the wine rack (Image 2). Your unit is now fully constructed (Image 3). 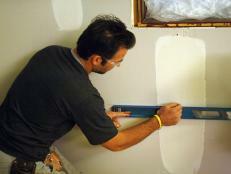 You may want to fill nail and screw holes with wood filler at this time. Allow unit to dry overnight for glue to harden and set. 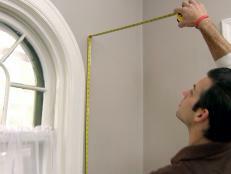 Prepare unit for painting or staining by sanding down corners and edges and then wiping free of dust using a damp cloth. 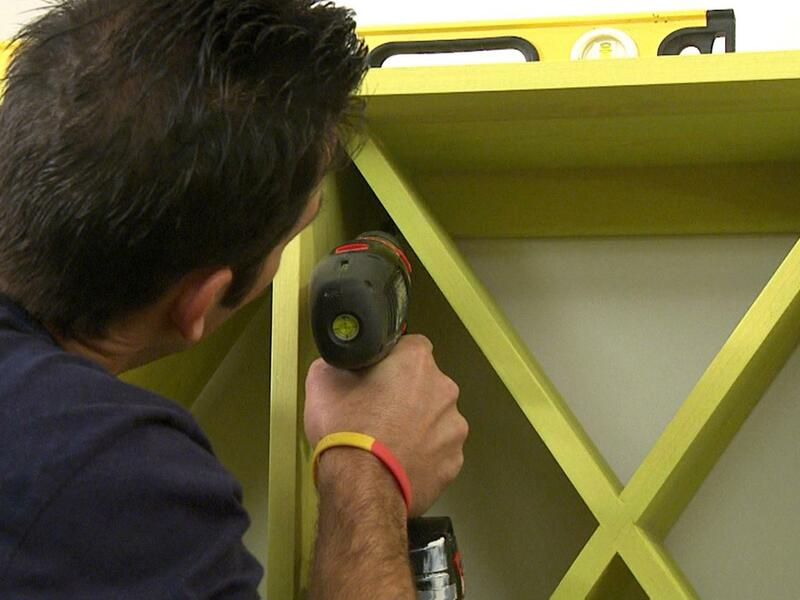 Host uses a drill to attach the light green wine rack to the wall while using a level to keep it straight. Important mounting instructions: Be absolutely sure to locate wall beams for securing the unit through the rear mounting strip. The eight individual triangular compartments will enable easy bottle retrieving.